Everything is a differentiation of itself; what has a front has a back, what has a back has a front, and the bigger the front, the bigger the back. 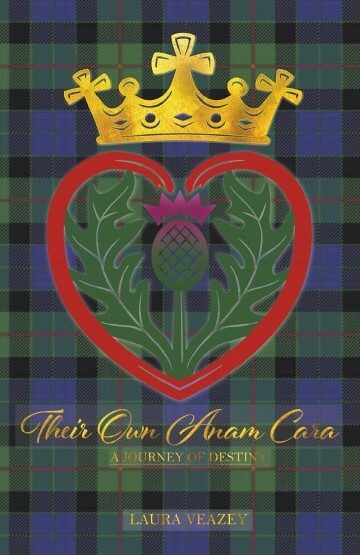 is certainly holds true in THEIR OWN ANAM CARA…A JOURNEY OF DESTINY, the first of the Anam Cara Trilogy. Sir Ailin Drummond and Sarah “Angel” Evangeline Hale, a direct descendent of Boadecia, Queen of the Iceni, in the 1600’s in Scotland and Ireland, are caught up in the turbulence of the times. They’re faced with plantationists, dark and light magyk, pirates, druids and druidesses, clan battles, the whisky trade, and magical creatures. Through it all, they begin to learn what love, hate, loss, vengeance, hope, and faith can do to break or transform their lives. Laura Veazey Morrison-Roets has a diverse background in traditional naturopathy, allopathic health, therapeutic and outdoor recreation, has earned an EdD in Applied Educational Studies and a PhD in Traditional Naturopathy, an MA in Athletic Administration, and is a Licensed Alcohol and Drug Counselor, Certified Reciprocal Alcohol and Drug Counselor Supervisor, Certified/Licensed therapeutic Recreation Specialist, and a Case Manger III. 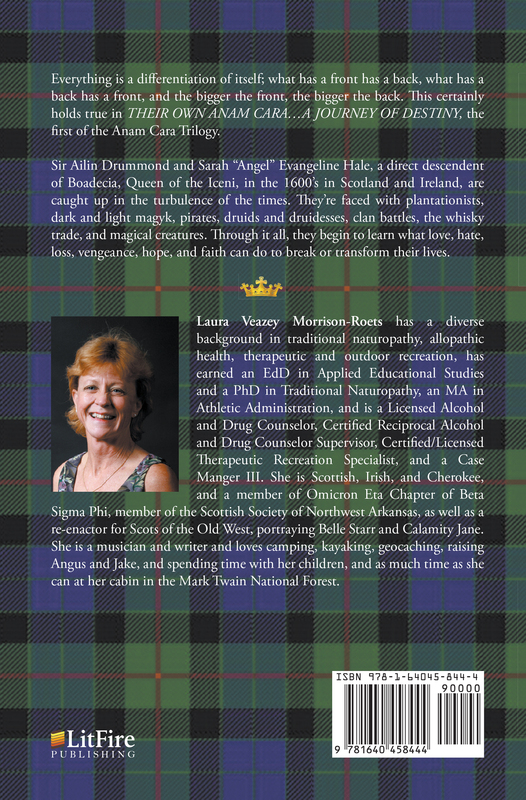 She is Scottish, Irish, and Cherokee, and a member of Omicron Eta Chapter of Beta Sigma Phi, member of the Scottish Society of Northwest Arkansas, as well as a re-enactor for Scots of the Old West, portraying Belle Starr and Calamity Jane. She is a musician and writer and loves camping, kayaking, geocaching, raising Angus and Jake, and spending time with her children, and as much time as she can at her cabin in the Mark Twain National Forest.